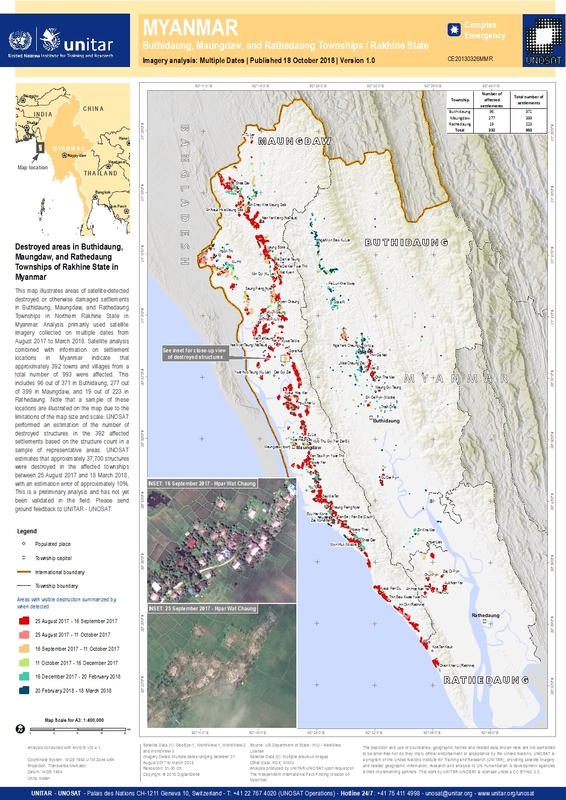 This map illustrates areas of satellite-detected destroyed or otherwise damaged settlements in Buthidaung, Maungdaw, and Rathedaung Townships in Northern Rakhine State in Myanmar. Analysis primarily used satellite imagery collected on multiple dates from August 2017 to March 2018. Satellite analysis combined with information on settlement locations in Myanmar indicate that approximately 392 towns and villages from a total number of 993 were affected. This includes 96 out of 371 in Buthidaung, 277 out of 399 in Maungdaw, and 19 out of 223 in Rathedaung. Note that a sample of these locations are illustrated on the map due to the limitations of the map size and scale. UNOSAT performed an estimation of the number of destroyed structures in the 392 affected settlements based on the structure count in a sample of representative areas. UNOSAT estimates that approximately 37,700 structures were destroyed in the affected townships between 25 August 2017 and 18 March 2018, with an estimation error of approximately 10%. This is a preliminary analysis and has not yet been validated in the field. Please send ground feedback to UNITAR - UNOSAT. Analysis produced by UNITAR-UNOSAT upon request of The Independent International Fact-Finding Mission on Myanmar.